Okay, so first off huge applause for BioWare making this happen and letting us all have a onetime free Legacy name change, but I have to ask BioWare…why even include it in the patch if you are not ready to offer it to the community? That is like having your kids come downstairs for Christmas letting them see all the presents, you know the ones not wrapped from Santa, and then saying well we are not sure when we are going to let you have them. It just doesn’t make sense at all. BioWare, I love you, I truly do, but you are making it hard to love you. You are losing touch with your community. They want definite timeframes and/or dates. Speaking of which, you have officially 10 days left of summer…remember last of the server transfers would be done by the end of summer? We gamers are very fickle, and I throw myself in that group. We want news, we want content and you will never make us all happy. That said, I know I would rather you put yourself out there and set an actual date, if you make it by then it is a huge success, but even if you don’t just be honest as to why and set the new date. We are fickle, yes, but we only want to be kept in the loop and when your answers are always vague that makes us feel uneasy. Just open up and be honest with your community. There are many people who love to buy and sell on Ebay. If you are a very educated consumer, you can get some really great deals. 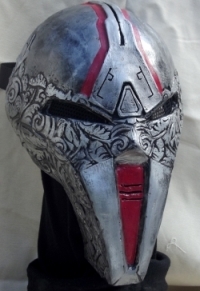 One particular and creative Star Wars enthusiast has decided to sell a Sith Acolyte mask as seen in the” Deceived” trailer for SWTOR. As you can see and read from the Ebay listing, this fan created the mask, by himself and has done a fairly decent job recreating a mask that became famous from all those times people saw that very trailer. Now I seriously doubt this will become a collectible, but it is a very detailed mask and huge kudos goes out to the maker of the mask. So if you have a desire for another mask to add to your Star Wars collection or possibly needing to get that unique Halloween costume…here is your chance. This week’s Community Round-Up has some more upcoming server events. Be sure to check and mark your calendars for these events. Check the dates over carefully, because some of them will be happening soon, this weekend…while others look to be reoccurring events. Be sure to check out the links to the listed events above to make sure of times, dates and location so you do not miss a minute of the action. What sort of events would you like to see your server or BioWare support in-game? Let us know your ideas in the comment section below. 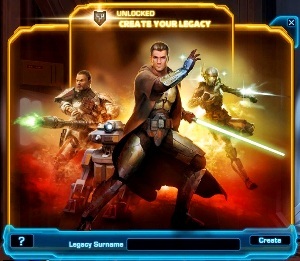 This week in the SWTOR Subreddit section of the Community Round-Up, one of the linked topics has to do with what titles would you like to see in SWTOR? They have some very creative ones listed. The ones I saw, that I would like to see in the game have to do with the planet quests. Make it mean something to complete those planet quests, even if it is a title. Hmm, maybe titles for eliminating a certain number of a certain type of NPC? Oh, you want to get Open World PVP in the game…offer a title like Death Dealer or something wild and trust me you will have folks flagging for PVP to try and get that title. BioWare, listen to your community…gamers like challenges and marks for overcoming those same challenges. What are some wild or creative titles you would like to see in the game? Please leave your suggestions in the comment section below. 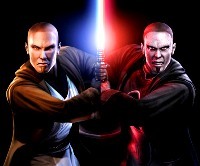 Have you played or are currently playing a Sith Sorcerer? Well in this week’s Community Round-Up there is a forum thread for you. It is a complete guide to this advance class of the Sith Inquisitor. It goes through all aspects of this advance class choice…from the basics to some information on companions. Now for those worried about spoilers please know that if they are talking about companions there are potentially some spoilers. You have been warned. I thought this guide was great and will help when I get time to level up my lowbie sorc in the future. The next thread from the forums has to deal with the morality of those of us playing Empire characters. Are you playing a truly evil and full blown Dark Side or are you playing a Light Side loyal Imperial? I love this type of question. It is like our Sith or Jedi questions in the weekly podcasts. Currently I’m playing a Light Side Sith Juggernaut and love the moral decisions you must face. I also play on the Republic side and this question would not work as well, in my opinion. On the Republic side, you have to be a complete jerk when being Dark Side or a “goodie two-shoes” when being Light Side. On the Empire side you seem freer to make Light or Dark Side choices and still maintain what you envision your character’s moral code to be. Those are just my opinions, but go check out the thread and leave your thoughts, also be sure to let us know in the comments below what type of Empire character you are playing, Light or Dark Side. Now these are just a sample of the links in the Community Round-Up this week. For complete details on all these events and threads head over to check out the official blog post on the SWTOR website. I love highlighting members of our community that write fan fiction. It is something I enjoy doing, and even more so, I love reading what others create. There is something to be said for taking a universe of lore like Star Wars and making a part of it, no matter how big or small, our very own. This writer is no exception. 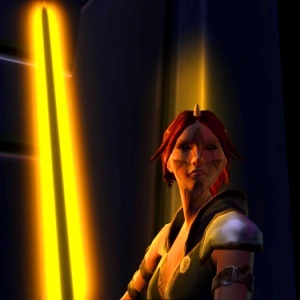 She has taken a simple avatar, she created for Star Wars: The Old Republic and given that digital persona a back story…her character has a personality and has been brought to life. Don’t take my word for it, read about Shartrael and see what you think. 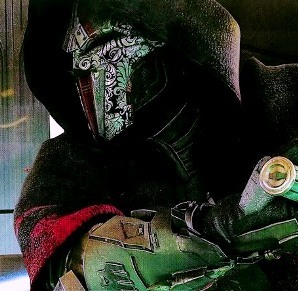 While it might be just a short glimpse into this character, I wouldn’t be surprised if we don’t read more about this Jedi in the future. Why am I so sure? I just happen to be privileged enough to know the author, she is my niece and I am very proud of her! Summer is coming to a close and school is now in full swing. Most of us have got so much going we barely get a break. Why not take a few moments catch your breath and check out what has been going on the past week here at Corellian Run Radio. Below we have links to this week’s articles and podcast for your convenience. There is also a link to our Youtube channel, where we will be adding new content in the next few weeks…stay tuned! After you finish reading the articles, listening to the podcast, and watching the videos please be sure to leave comments for our staff. We really love your feedback and discussions. We also want to hear what you would like to see more on the site. Now I couldn’t pass up finding another off the wall Star Wars fan story. 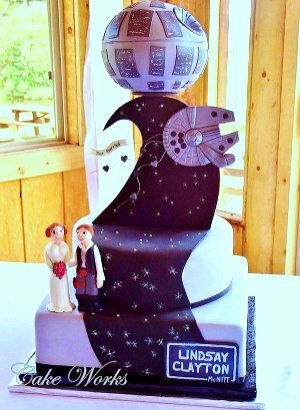 This week we have a story from TechnaBob.com about a wedding cake, and not just any wedding cake…it’s a Star Wars wedding cake! Okay, that says awesome already and signs for a long-lasting marriage. However if you look at the details and the added extras for the wedding theme it really makes it a one of a kind cake. This already is a day they won’t easily forget, but there is no way they are forgetting that cake. Hopefully when they are sitting on a porch, looking at the sunset after many, many years of marriage they will recall their special Star Wars wedding cake and smile…soon followed by a race to the Holo-projection to watch the original Star Wars movie. Thank you for linking to my ebay listing. Well, thank you for the link and the kind comments all the same.